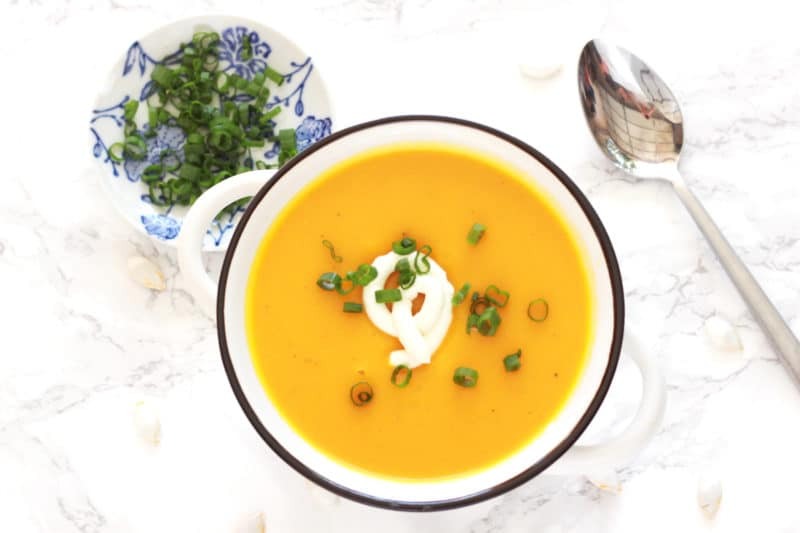 Easy and delicious, this Hubbard Squash Soup is perfect for this fall season! Naturally gluten free and vegan, this soup is perfect for lunch and pairs perfectly with a sandwich or a salad! What are we going to do about Bob? Yes, I’m starting off my post today talking about Bob and although that may seem a little weird, I have a story to share with you. All my food blog followers know I’m a part of a lunch coop at work. There are 8 of us and we meet once a month during lunch. Each month, 2 people pair up and collaborate on what they will cook and they bring it to work for all of us to share during our lunch hour. The reason we started doing this a year ago is so we could try a wide range of recipes and share the dishes with our group. We have gotten some amazing recipes from this group. I’ve even featured some on my website…like this Crock Pot Cabbage Roll Casserole. Ok, so it’s been a month since our last lunch coop and STILL no recipe from Bob. I was bugging him almost every day to share his recipe with me and he was like, “I will, I will…” and of course, he never did. So last Wednesday, I finally made him stop and talk to me about this. 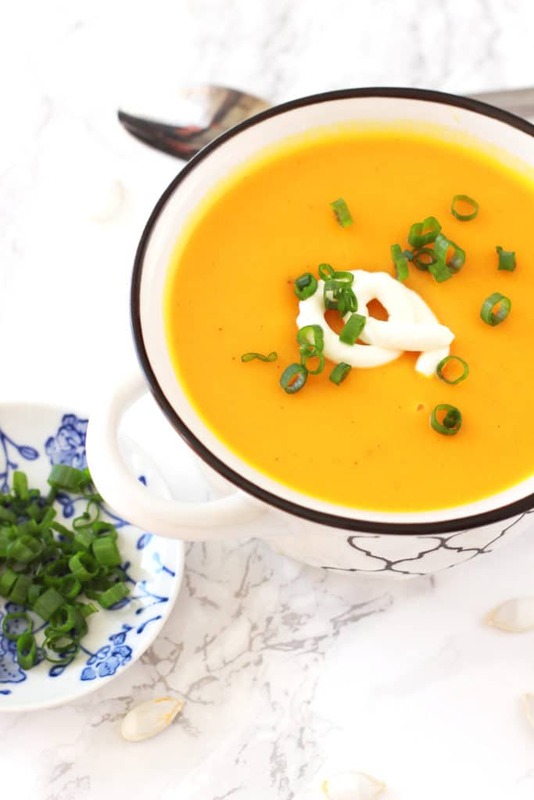 Why was he not sharing this amazing gluten and dairy free soup recipe?!?! Doesn’t he know my dietary needs?!?! When we talked, he told me he got it off a girl’s website he follows. Well, that’s vague! So, I went to the website and it was a Butternut Squash Porridge Soup recipe with rice balls. When I started reading the recipe, I quickly figured out that he must have altered it BIG time and sure enough he did. Ok, so here is a secret about Bob. Bob is a really great cook. I mean REALLY REALLY GREAT! I even featured his Southwest Meatballs on my site, so you know his recipes are worth repeating! He’s absolutely a foodie so I said to him…”Tell me what ingredients you used and I’ll just recreate it this weekend and share it with the group.” Bob told me he used water, butternut squash, rice flour, salt and pepper. That’s it. As we were talking, Bob told me he wishes he had used Blue Hubbard squash instead of butternut, so I told him I’d use Blue Hubbard when I make it. I went to the store and grabbed all the ingredients and started making the soup. I’ll get into how to make this soup in the directions below, but let me tell you…as I did what Bob told me to do to recreate his recipe, mine tasted nothing like his! So, I did what he did and started throwing stuff in that I thought would be good and let me tell you…it turned out so good!! So here we go…this is how I created Bob’s famous butternut squash soup, instead using Hubbard squash. This soup is Gluten free and vegan! One thing I want to point out right now is when you cut a Hubbard squash…be careful. It has an insanely hard shell. I made Mr. Mason cut it for me because I got nervous. Feel free to use whatever squash you want…Butternut, Acorn, Blue Hubbard, Hubbard, etc. And to my lunch coop friends…here’s the recipe! FINALLY! Start out by cutting your squash horizontally. Again, be really careful cutting your squash, regardless of the type you choose to use. Once it’s cut, scoop out the seeds and pulp and discard. Brush the 1 Tablespoon of extra-virgin olive oil onto the flesh of your squash until it’s lightly covered. Sprinkle salt and pepper lightly to season. When the squash is done, take an ice cream scooper and scoop out the squash. Place in a blender or food processor. With my Hubbard squash, I had about 3 to 3 1/2 cups of squash after I was finished scooping. Slowly add a cup of water to your blender/food processor and puree until your squash is pureed. You want your consistency to be a little on the liquid side after the puree. Once the squash has been pureed, move the mixture to a large pot. Cooking temperature should be set to medium-high. Add in the rice flour, 2 more cups of water, salt, pepper, butter and ground nutmeg. Cook the soup until it comes to a rolling boil. Turn down the burner to medium heat once it reaches the rolling boil. Let your soup simmer for about 10 to 15 minutes, stirring as needed. Add more salt and pepper as needed per your taste. Top this soup off with your favorite toppings! I used sour cream and scallions. Enjoy this one! 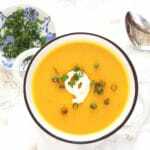 Pin this HUBBARD SQUASH SOUP to your favorite VEGAN, GLUTEN FREE and SOUP Board on PINTEREST!! I think that’s how all food bloggers started out…a little of this, some of that…..and oh my goodness this is good but what exactly did I do? I love a good soup and cannot wait to give this one a try! Pinned. Thanks Carrie! This one is fantastic!! This sounds fantastic! I love finding ways to make luscious soups like this without adding cream. I’ve got great recipes for roasted tomato soup like this, and one with carrots and red peppers, so I can’t wait to try your (Bob’s!) recipe for squash! So I really need to learn more about squashes apparently. The color on the soup is gorgeous. I can totally see this as the first course for a beautiful Thanksgiving dinner. Oh thanks! Yes – this one has a really beautiful look!! And it’s a perfect dish for Thanksgiving!! Yes! I have not made this with coconut milk but it would be amazing! It would make it more sweet for sure though…I like the salty more savory soups! Never tried Hubbard Squash, but this looks delicious! I will look for them now. Squash soup and stew is great. Try princess pumpkin, crook or long neck squash they are an awesome dense flesh with best flavor and colors even mix them at times. I often have not had to use a flour and limit my liquid except to add another dimension to flavor. Be careful if flesh is hot when blending. My proNinja does better job than Cuisinart. Have fun playing with spices; cardamon, pumpkin types. I know someone that likes to use sweetened condensed milk from her grandmothers recipe. Yes – I love to play with different spices in my soup recipes! That’s really good info about the difference between your blenders! Thanks for sharing! !